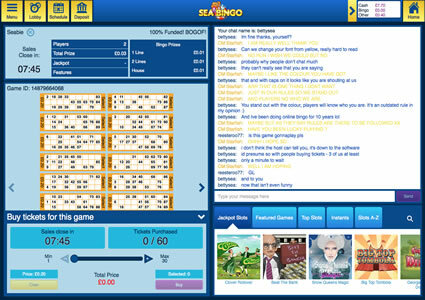 Sea Bingo took a dive into the online bingo ocean for the first time in the summer of 2015 and what a splash it created! The brand was the first new bingo site to launch from the Playtech / Virtue Fusion camp in quite some time so the opening had been anticipated for quite a while before it actually welcomed players. When you visit the site for the first time you are reminded of the film Finding Nemo, a clown fish is the mascot for the brand and he sports a very cheeky smile. You instantly feel welcome with a paradise island and inviting bingo waters waiting for you at Sea Bingo. That’s without even mentioning what this brand has to offer by way of treats for the new players. At the time of launch (and please note this may be a time limited deal), newbies were given free Thornton’s chocolates with their first deposit as well as a cash match bonus. However, if you can wait until the end of the month in which you register, they’ll also give you 99 free tickets to a £1,500 jackpot game. There is certainly enough on offer to entice you to at least paddle in their bingo waters. It took just a few moments to register an account with Sea Bingo and we were then ready to create a chat username, the name by which you are called in the rooms. As soon as registration is over you are taken to the lobby and it is here you can notice the difference between this brand and those on the older software from Playtech / Virtue Fusion. The whole design looks fresher with a navigation menu that’s easier to, well, navigate around the site. 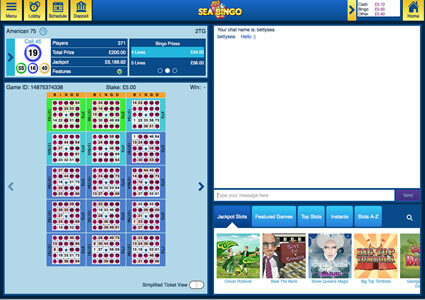 The new software is better all round and if you step into a bingo room, you’ll find one of our favourite features of the new software, the Simplified View for bingo tickets. 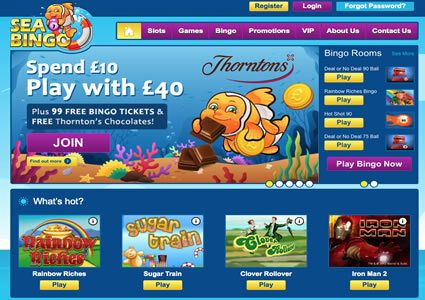 It’s a feature that you have to check out when you pop along to Sea Bingo. All in all this is an impressive site that has a decent welcome bonus and great potential, let’s hope it grows from the little fish in a big ocean to one of the most popular online. There’s definitely a good chance of that. 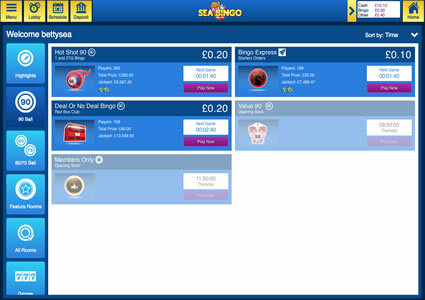 Sea Bingo has a great selection of bingo games available for the discerning player. From the moment you step into the lobby, this is apparent. There is a veritable smörgåsbord of bingo to choose from and the new navigational menu helps you choose which suits your needs. This brand is home to 75 ball (multi-line and pattern), 80 ball and 90 ball games along with some of the most popular themed bingo on the software. You’ll find Deal or No Deal Bingo (in both 75 and 90 ball options) and Rainbow Riches Bingo. The jackpot for this game is seeded at £10,000 and every day it increases by a percentage of the stakes made in the previous day. Free games are available at Sea Bingo every day from 2pm through until 5pm. These games are played in the Members Only room and offer a prize pool of £3. You are offered the option to make them Superbooks by buying tickets, the prize then increases to £30 per game.